A STATUS YELLOW snow-ice warning has been issued for this afternoon, with heavy rain set to turn to sleet and snow later today. Met Éireann issued the warning this morning for Munster, Leinster, Cavan, Monaghan, Galway and Roscommon. It will come into effect at 2pm this afternoon and remain in place until 8am tomorrow. A separate Status Yellow rainfall warning is also in place for Munster and Leinster and will last until 6pm today. Heavy rainfall will give accumulations of 25 to 30mm. 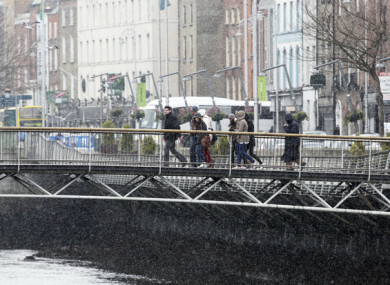 “Heavy rain will turn to sleet and snow today,” Met Éireann said. “Much of the snow will be above 300 metres with just a local dusting of snow at lower levels. Wet and slushy roads are likely to become icy in places overnight as temperatures drop below freezing. Rain in southern counties is set to spread northwards to most areas by this afternoon, turning heavy in some areas with a risk of spot flooding. The rain will turn to sleet and snow in places as the day goes on, with temperatures dropping to between 1 and 5 degrees. A lot of the rain should clear by tonight, with temperatures dropping to -1 to 2 degrees. Frost and icy stretches are expected in places. Tomorrow will be a cold, bright day with a mixture of sunshine and scattered showers. The week ahead is due to be unsettled, with showers and bright spells. Email “Heavy rain, sleet and snow forecast today, with temperatures dropping to freezing tonight”. Feedback on “Heavy rain, sleet and snow forecast today, with temperatures dropping to freezing tonight”.